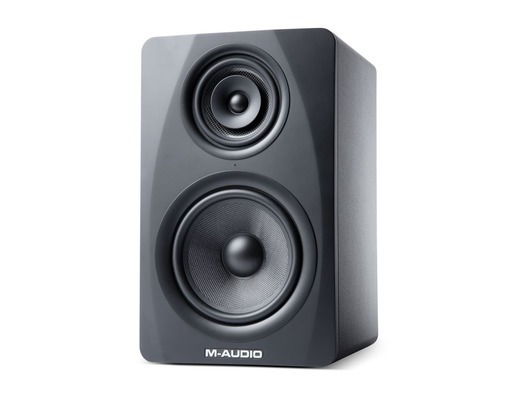 Step up to superior three-way sound with the M3-8 Black studio monitor from M-Audio. Savor the improved fidelity, enhanced imaging, and super-wide sweet spot of this exceptional three-way studio monitor as you mix your sessions and laydown tracks. Track and mix with the enhanced accuracy and superior imaging that only a three-way monitor can provide. Using an efficient inline design, the space-saving M3-8 Black Studio Reference Monitors provide truly spectacular three-way sound in the same space as a standard two-way monitor. The efficient M3-8 Black design allows the mid- and high-frequency drivers to be mounted inline. By delivering sound along the same focal plane, the M3-8 Black speakers deliver improved time-alignment for fatigue-free listening. Lightweight woven Kevlar endows the 8" low-frequency driver and 5" mid-range driver with strength and reliability. The 1" silk dome tweeter offers integrated waveguides to provide increased clarity. The cabinet provides tuned bass porting and optimized internal bracing to produce the highest levels of fidelity. Three individual amplifiers provide power to each of the three speaker elements. A total of 220 Watts of Class A/B amplification empowers the M3-8 Black with ample headroom for even the loudest mixes. Finely tuned crossovers deliver rich tonality across the entire frequency spectrum. The powerful three-band EQ-and a switchable low-cut filter-allow you to shape the sound to match your listening environment. Pinhole-mounted blue LEDs provide an easy-to-use visual aide for perfect speaker placement. The result is an outstanding monitor able to perform in the most critical of listening environments. Here we have the M-Audio M3-8 Black Studio Monitor in new and manufacturer refurbished which will come boxed 'as new' with a 1-year warranty. Buy this amazing monitor with confidence with 100% satisfaction guaranteed or your money back!